So, you find yourself in Philadelphia, America’s first capital, home of Ben Franklin and revolutionary history. You’re hungry and want to eat like a Philly native eats! What if you could walk into one space in center city with the aromas of fresh java, baked goods, burgers, deli sandwiches, Asian food, fresh bread, BBQ, soul food, Indian cuisine — and still have more to choose from? If this sounds good to you, then you WILL have trouble deciding what to eat. 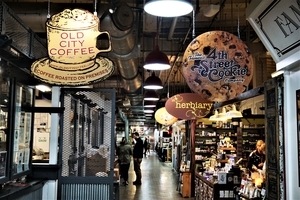 Philly’s Reading Terminal Market has over 25 restaurants and we haven’t even added the bakeries and sweets yet! 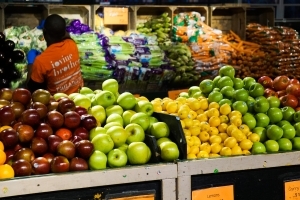 The indoor market has been open for business since 1893, currently with over 80 merchants in the space of about a couple of football pitches, with specialty shops, grocers, flowers, produce, fresh meat, and more. Bringing along my sis to help, we sampled what we could in order to bring some highlights here. First up, Old City Coffee, with small batch micro roasted joe from over 25 global locations. Try the old city blend with hints of orange and black pepper. Termini Brothers Bakery serves La Colombe Coffee, an artisanal java that can be found in four locations in Philly. 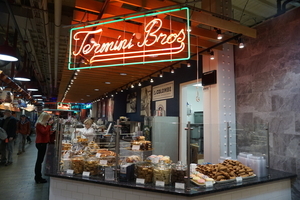 Termini Bros is one of Philly’s best Italian bakeries with a menagerie of confections including fresh cannoli, pastries, cookies, and more. 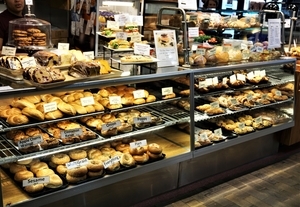 The scent of fresh roasted coffee and sugary sweetness dominates the northeast corner of the market. Wanting something hearty, we tried the famous Tommy DiNic’s with hot roast beef, pork, and meatball sandwiches. The roast pork sandwich with broccoli rabe was voted Travel Channel’s Best in America in 2013 and it is just as popular now. It’s meaty, with a touch of stock to add moisture and flavor, with provolone and a spot of bitter from the greens. I preferred the Italian sausage with green peppers covered with spicy mustard. The bread here is Philly style — flaky outside and soft inside that bites easily without being too chewy. Heaven! Keven Parker’s Soul Food place had a small line of folks who promised us taste. The fried chicken was crispy and moist and delivered. The spices were evident, not washed away, and the black-eyed peas still had a bite, not overcooked and mushy like many places prefer. There were candied yams, collards, mac ’n’ cheese, and more for future trips. The Amish came in big with Beiler’s Bakery. There are more baked breads and pies made the Pennsylvania Dutch way than you could dream of eating. The cream-filled powdered doughnuts and the blueberry fritters were among the best I’ve tasted, and I have tasted sweets all over Amish country! Also, Bassetts Ice Cream had mouthwatering cherry vanilla with chunks of cherries. They offer over 40 flavors. We also tried fruit smoothies from Kamal’s, a Middle Eastern cuisine place with fresh fruits and veggies to give you a natural flavor boost. We had coconut, pineapple, and mango mixed but you can make your own concoction. The Amish shops are closed on Sunday and most on Monday, too. The market itself is open seven days from 8 a.m. till 6 p.m. Jack from Old City Coffee says, “weekdays from 11 to 2 are busy but Saturday can be a little crazy!” That said, we were there on a Wednesday and it was quite tolerable. Also, Carmen’s Famous Italian Hoagies and Cheesesteaks had a 20-minute line for over two hours… must be good! All the available food options are listed on the website with info on each individual merchant. If in Philly, don’t miss out!